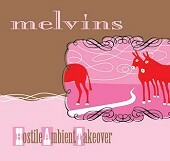 Hostile Ambient Takeover, the latest from The Melvins, is another slab of concrete rock so thick and so solid that even the hardest thump to the songs couldn't break them. Flowing together like super glue, the songs make up the complete package, an iron-fortified collection of dangerous, explosive music that won't compromise, going at its own speed, and running over anyone in its path. Simply put, this is The Melvins, loud and proud, cranking out the demented sounds as they do best, putting metal in its grave and giving shame to those who call what they do rock, as nobody hits harder or packs a meaner punch than these guys. I'll give it an A.